After months of gross negotiations between craven billionaires, what was all but official is reportedly one step closer to being actually official: the Oakland Raiders are preparing to file relocation papers for their move to Las Vegas, according to Ian Rapoport of NFL.com. The NFL gave the Raiders a window of about five weeks to file for relocation—from their playoff elimination last weekend to February 15. After their paperwork is submitted, the team will need approval from three-fourths of NFL owners to make the move a reality. That vote should come this spring. The news comes three months to the day after the Nevada State Assembly approved a bill raising taxes to help pay for a new NFL stadium. 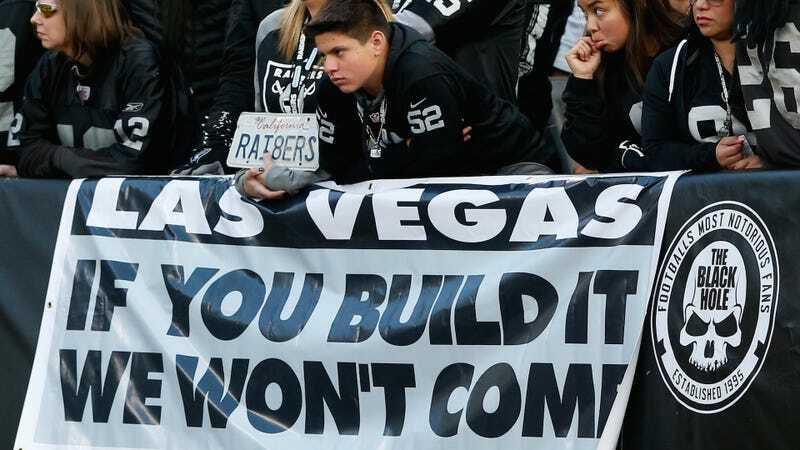 That tax increase will give the Raiders a record $750 million in public money for the proposed $1.9 billion stadium, with casino tycoon Sheldon Adelson chipping in a reported $650 million of his own to help cover the rest. (Though the Raiders have promised the NFL that they have commitments from Goldman Sachs to cover Adelson’s share if he pulls out, which is a possibility that Adelson has discussed in his up-and-down negotiations with team owner Mark Davis.) The Raiders will be responsible for the remaining $500 million for the stadium, almost none of which will come from the team itself—a sizable loan from the NFL, plus the sale of new personal seat licenses, will take care of much of that.